Ready to write your first client script to see things in action. Lets get started; we'll keep it simple. We will draw your attention to important facts during the walkthrough, and provide references to actual methods as appropriate. You can review the complete sample code used in the walkthrough later in this topic. In this case, all the functions defined in this library can be used as Sdk.[functionName]. Define global variables: The following section defines some global variables to be used in the script. Note that you now don't need to go through the form context to get the user name. Context information is now available globally using the Xrm.Utility.getGlobalContext method. Code to execute on the OnLoad event: This section contains the code that will be executed when the account form loads. For example, when you create a new account record or when you open an existing account record. The code uses the executionContext object to get the formContext object. When we attach our code with the form event later, we will remember to select the option to pass the execution context to this function. 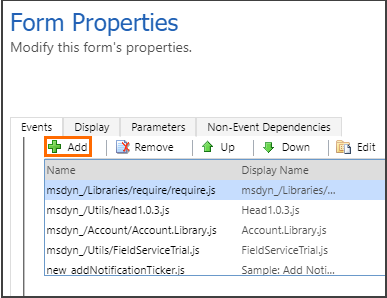 Next, we display a form level notification using the setFormNotification method. Next, we use the setTimeOut method to delay the execution of the clearFormNotification method to clear the notification after 5 seconds. 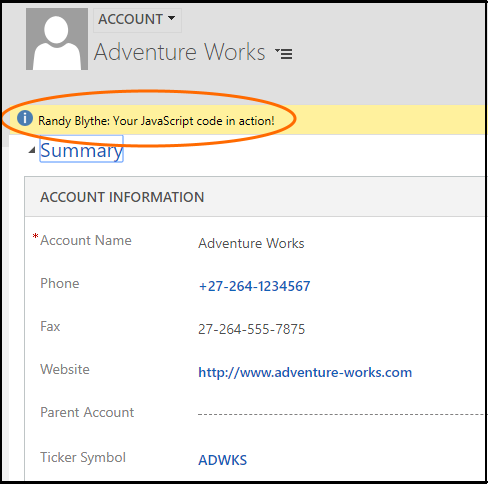 Code to execute on the OnChange event: Code in this sections will be associated with the Account Name field in the account form so that it gets executed only when you change the account name value. The code performs a case-insensitive search for "Contoso" in the account name, and if present, automatically sets values for some fields in the account form. // Automatically set some field values if the account name contains "Contoso"
Code to execute on the OnSave event: The code in this section displays an alert dialog box using the openAlertDialog method. 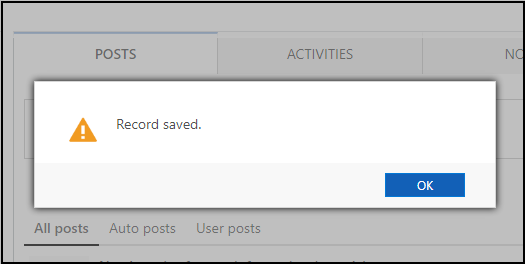 This dialog box displays a message with the OK button; user can close the alert by clicking OK. Note that we are not passing in the execution context in this function as its not required to execute Xrm.Utility. * methods. Now that your code is ready, you want to associate it with events in model-driven apps. You use Script web resources in model-driven apps to upload the script to your model-driven apps instance, and then associate it with events. Navigate to your model-driven apps instance in browser, and go to Settings > Customizations. In the Customization area, choose Customize the System. 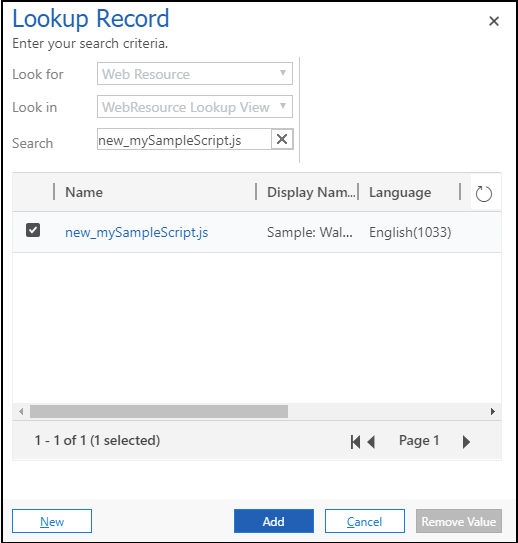 In the solutions explorer, under Components, choose Web Resources. Choose New to create a web resource. In the new web resource dialog, specify the Name and Display Name for your web resource. 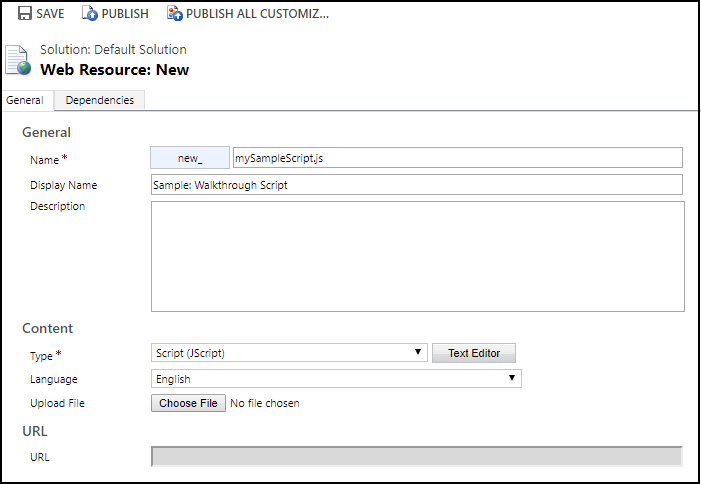 For example: "mySampleScript.js" and "Sample: Walkthrough" Script. Choose Publish to publish your web resource. 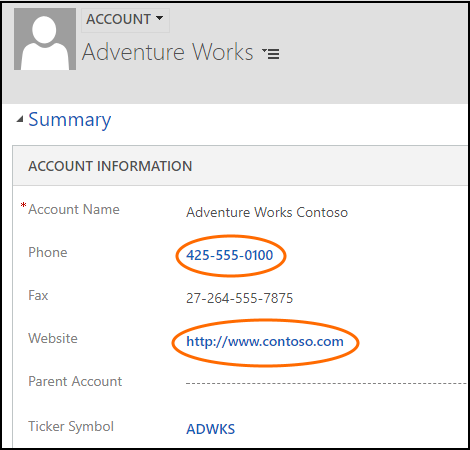 Navigate to your model-driven apps instance in browser, and go to Sales > Accounts or Service > Accounts. Open an account record, and select Form to open the form editor. 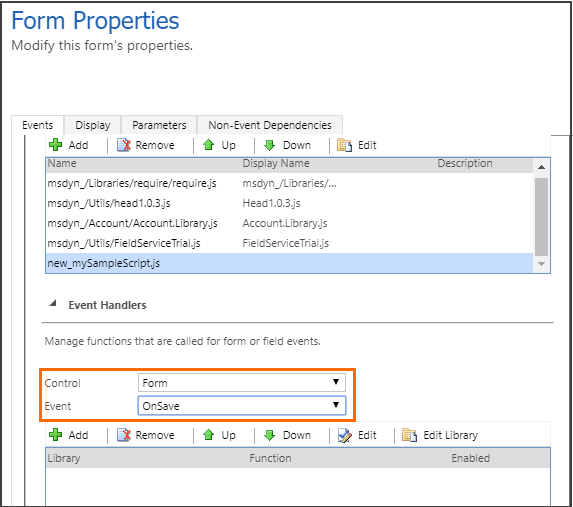 In the form editor, select Form Properties. In the Form Properties dialog box, under the Events tab, click Add to search and add your web resource. 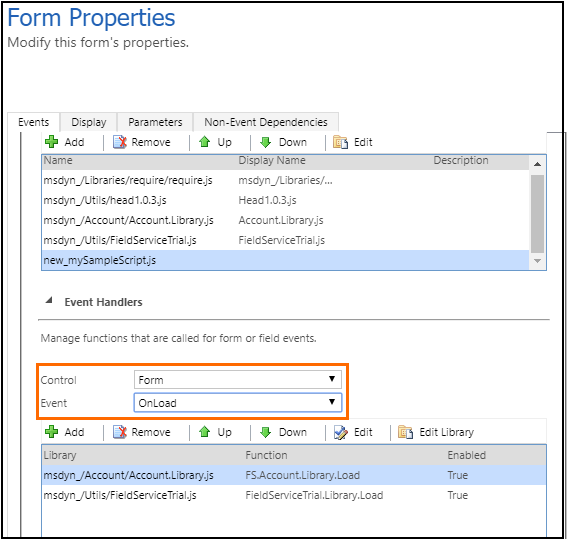 Under the Event Handlers section, select Form as the control and OnLoad as the Event; click Add to add an event handler for the OnLoad event. 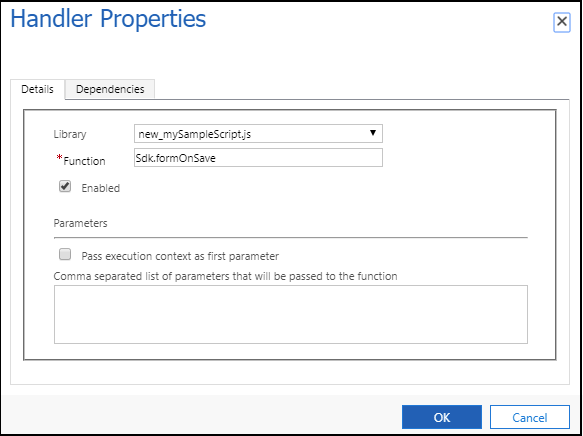 Select Pass execution context as first parameter to pass in the execution context as a parameter to this function. If you review the function definition in the code, we are passing an executionContext object to our function definition, and selecting this option wires them up. Click OK to return to the Form Properties diaog box. Under the Event Handlers section, select OnSave as the Event this time, and click Add to add an event handler for the Form OnSave event. In the Handler Properties dialog box, select the name of your web resource from the Library drop-down list, and specify Sdk.formOnSave in the Function field. We won't pass the execution context to the function this time as the Sdk.formOnSave function code does not require it. 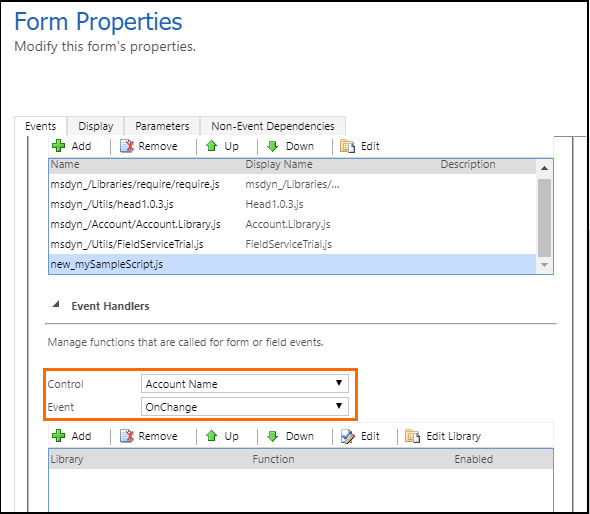 Under the Event Handlers section, select Account Name as the control and OnChange as the event; click Add to add an event handler for the OnChange event. Select the name of your web resource from the Library drop-down list, and specify Sdk.attributeOnChange in the Function field. Click OK in the Form Properties diaog box to return to the form editor. Click Save to save the changes to the form. Click Publish to publish the form changes. Sign in to your model-driven apps instance. Browse to Accounts, and try to open or create a new account. In this case, we will open an existing account to load the account form. You will see a notification conytaining your user name that will automatically disappear in 5 seconds. Edit the account name to add "Contoso" in the name and move to the next field by pressing TAB. This will fire the OnChange event, and will automatically update the Phone, Website and Description fields with the value specified in the code. Finally clicking Save will fire the OnSave event, and will display the alert dialog with a message that you configured in your code. Click OK to close the alert.